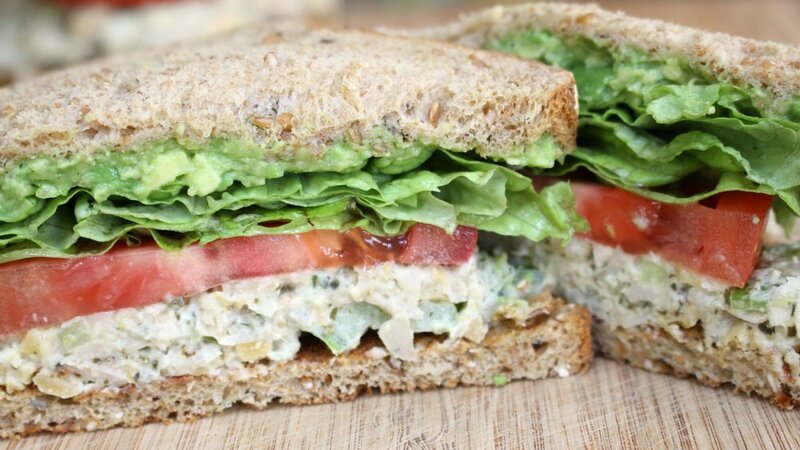 I still get nostalgic when I think about the tuna salad sandwiches my mom used to pack in my school lunches. I've been making a vegan version with chickpeas for years, but lately I've been adding jackfruit into the mix and absolutely loving it! Young green jackfruit, available at Asian markets and also now at Trader Joe's, takes on a "meaty" texture when cooked and shredded. It has a mild flavor, especially when thoroughly rinsed and boiled. If you can't find jackfruit or would prefer not to use it, feel free to use 2 cans of mashed chickpeas instead. Kelp flakes are optional but they add a subtle savory, "fishy" flavor, plus a boost in a few minerals including iodine. You can jazz up this recipe in many ways; sometimes I'll add curry powder, raisins, or chopped green apple. Bring a small pot of water to a boil. Boil jackfruit for 15 minutes, until tender. Drain and allow to cool. Thoroughly chop jackfruit or pulse in a food processor. Roughly mash chickpeas with a fork. Add all other ingredients and season with salt and pepper to taste.